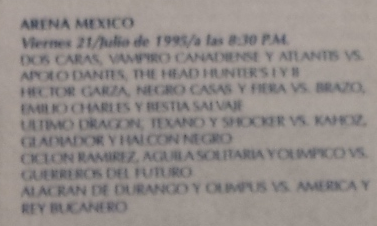 3) Canek, Dos Caras, Silver King, Tajiri vs Bad Blood, Head Hunter I, Head Hunter II, Miguel Perez Jr.
Head Hunter I was out due to a neck injury. Dantes refused to break a hold on Dos caras for a DQ. 5) Atlantis, Brazo de Oro, La Fiera b Bestia Salvaje, Emilio Charles Jr., Gran Markus Jr.
Mil pinned a Head Hunter for the win.